Pedaled to the local Farmers Market in the morning to show off the trike and recruit more petition signers. Was surprised to be approached by someone who knew not only what kind of trike I was riding (a velomobile), but the exact brand name (Go-One). Robin Kidney, who’s fascinated with electric vehicles, shared with me what she had learned on the web about Velomobiles, and the Go-One in particular. She then happily volunteered to keep an eye on it, while I grabbed some breakfast from the burrito stand. When I got back, she had gathered a small crowd and was handing out my business cards, asking people to sign the petition. I told her she’s my new PR agent! Spent the rest of the morning wandering the market, and spotting Robin for short breaks. Deeply appreciate your wonderful enthusiasm and help, Robin. Later headed over to a local park for the bike swap meet (where locals bring bikes and bike parts to swap out or sell) and got lots of interest in the trike. 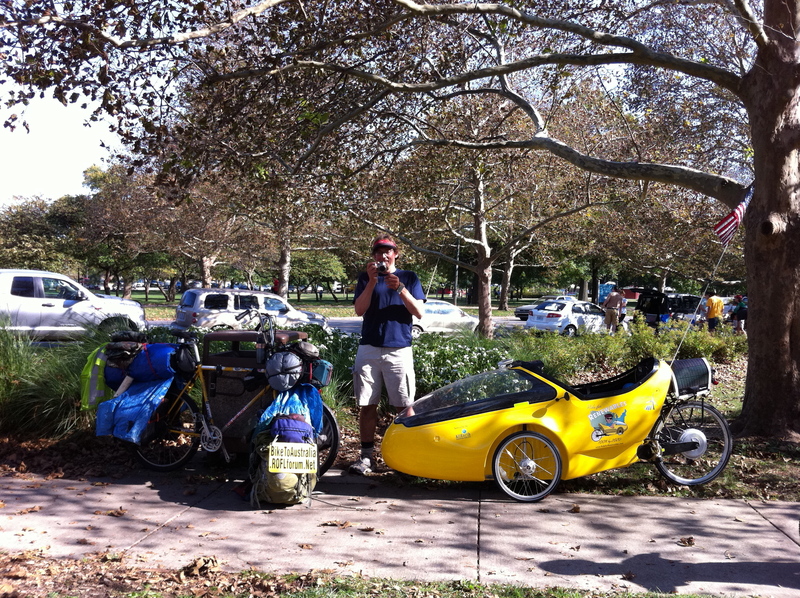 Met a guy, Ari Gold, who is one year into a decade-long ride to Australia (he’s taking the long way there). Checked out his bike, loaded down with gear. Made my trek look rather tame by comparison. I’m so backlogged on correspondence I had to turn down great offers of a pot luck dinner and drinks at a local bar to spend the night updating my blog and email database and getting the website ready for launch. Exciting Saturday night in Lawrence! This entry was posted in 2010 Ride, Blog and tagged ari gold, farmers market, go-one, kansas, lawrence, ride for renewables, velomobile. Bookmark the permalink.